Meatloaf has been around for a very long time. This is a recipe from a 1936 General Electric Kitchen Institute cookbook, The New Art of Modern Cookery. Dry onion soup mix and ketchup flavor this version of the simple everyday meatloaf recipe. 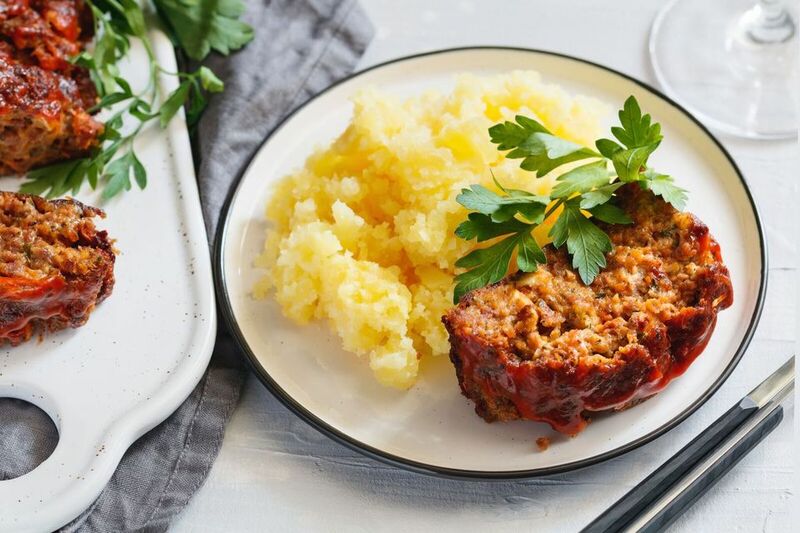 It's a classic, popular meatloaf, great with potatoes and green beans or steamed broccoli. Heat the oven to 350 F / 180 C / Gas 4. In a large bowl combine the eggs, ketchup, water, and soup mix; mix well. Add the bread crumbs and beef; mix well. Shape the meat mixture into loaf and place in a shallow, foil-lined pan, loaf pan, or meatloaf pan. Bake in the preheated oven for about 1 hour and 15 minutes. If you have any leftovers, try making meatloaf sandwiches the next day. Take a slice of reheated meatloaf and place it between two slices of toasted garlic ciabatta bread. Top with a little mayo, crispy fried onions, quick pickled red onion, a few sweet and hot pickle chips, pickled peppers, and barbecue sauce and enjoy!